Last November, 2012, the Family of Twelve, www.familyoftwelve.co.nz a fraternity of 12 of New Zealand’s most successful and enduring artisanal private winemakers visited Singapore. I had the privilege of organizing their programme titled “Twelve reasons to get excited about New Zealand Wines”, which was thoroughly action-packed, as detailed in F12 member, Nigel Greening’s account – click here. The most profound aspect of the F12 Singapore tour was their commitment to the New Zealand wine industry in its entirety and at every event, when the representative speakers of the group, Clive Weston and Nigel Greening, addressed the audience, they always delivered a strong message that the Family of Twelve’s mission was to not just promote their own wine, but all New Zealand wine and the diversity of the regions and producers. This was echoed by all the winemakers whenever they spoke at the events about their region and I found it thoroughly refreshing (in such a brutally competitive wine industry) to witness such cohesiveness and altruism amongst winemakers and a genuine push and aspiration to see the countries wine industry evolve in a harmoniously egalitarian way. When Chef Ahad and I discussed the F12 menu, I was also planning in a broader sense, with the knowledge that we had agreed to introduce this dish as part of a full dinner menu, using New Zealand produce, into her cooking-class programme, which is incredibly popular and particularly so with businesses of all walks that use these teamwork-structured classes for motivational, bonding events. What more perfect way to enlighten people on the bounty of New Zealand and specific wine and food pairings. 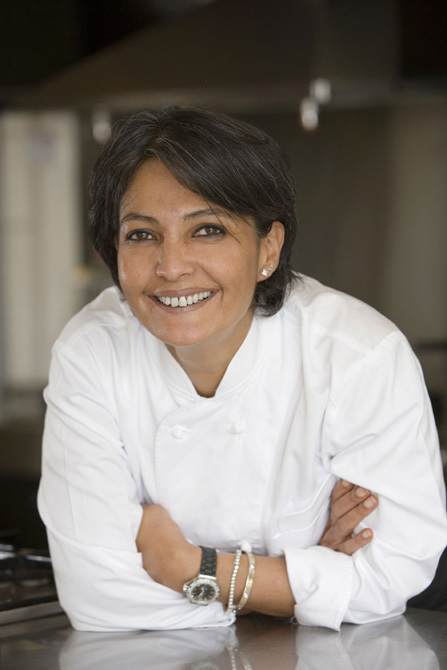 Ahad herself is also emblematic of Singapore’s multi-cultural society and crossroads of Asia and drawing on her Pakistani roots and classical French cuisine training, earned professionally in New York, her kaleidoscopic cooking repertoire is the perfect platform for my aim; to have her create a menu that embodies many parts of Asia, ideally using iconic New Zealand produce but also that these ingredients could be sourced universally so this menu can cooked practically anywhere in the world. 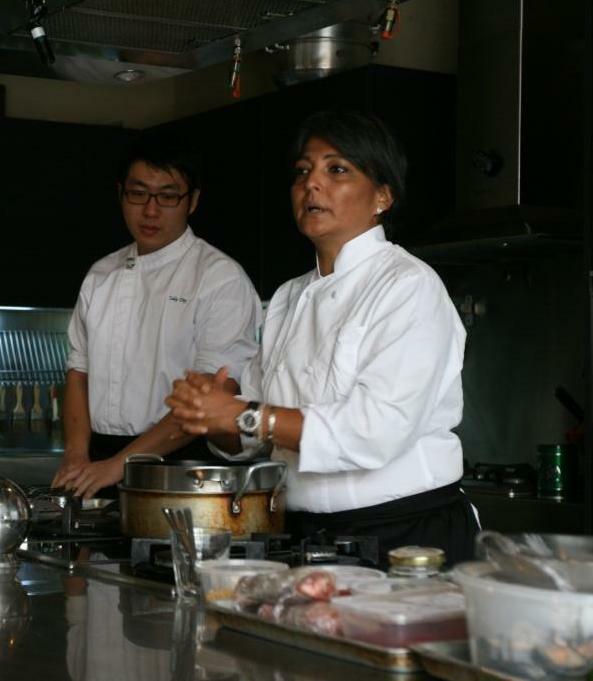 Equally important to this multilateral exchange is to bring this Asian-influenced menu to New Zealand; to inspire New Zealanders to experiment with Asian spices and techniques, and share the experience of how New Zealand winemakers are working in exporting and promoting their wines in the strategic Asia markets. Further to this, there are plans afoot to have Chef Ahad visit New Zealand and demonstrate this menus and host wine dinners this winter – she loves skiing as well! Ultimately, I needed a dish that was representative of Asia and would be absolutely perfect with practically any New Zealand Pinot Noir; a dish that would be hedonistically unique (like pinot), oozing seductive aromas (like pinot), with a tantalizing spicy warmth (like pinot), with an infused sweet and sour tangy flavour (like pinot), with a richness and depth of complexity that engulfs the senses (like pinot) and inspires intelligent gastronomic discussion at the table (like pinot) – a dish that would grab the olfactory senses and take you to a place far beyond your gustatory DNA – an out-of-body experience where you become half human, half grape – a pinot noir avatar. We began by deconstructing the genetics of New Zealand Pinot Noir, looking for the macromolecules inherently present in all regions and wines, and yes in the broadest of senses and sweeping generalisation, nevertheless enough chromosomes to stimulate good debate. For my part, I suggested to Chef Ahad one of the main nucleotides in New Zealand Pinot Noir is a pronounced spiciness (read Indian and Middle Eastern spices with cinnamon and turmeric prevalent) in both aroma and taste. By comparison to Burgundy, which also has a degree of spiciness although more intertwined with savoury and herbal nuances and a cooler tailing (a cold farewell on the palate), I find that New Zealand Pinots have considerably more lift in spiciness and a lingering warmth that carries the spiciness and melds with the richer fruit profile culminating in a most pleasing spicy-farewell. This lingering spiciness and warmth would clearly be conducive to a hearty, spice-infused dish and our initial thoughts leaned towards a wet dish with plenty of sauce to be in simpatico with the juicy, spicy succulence of the said pinot noir. Another genetic expression in New Zealand Pinot Noir is the ‘sweet and sour’ sensation of the fruit flavours exuded on the palate; that is the red or black berry fruits and sometimes heading to stone fruits like red and black plums, sometimes with the semblance of being poached and concentrated, with these spectrum of flavours asserting a sweetness or richness yet colliding with the naturally bold acidities that are inherent of the diurnal climate – warm, radiant dry days with the temperature plummeting at night and snap freezing in the bright fruit flavours and acidity – these climatic conditions and aspect unique to the New Zealand’s far-south proximity. The sour factor however does have some unique (strange) key flavours that I identify with the tamarillo or tree tomato as it is known in New Zealand, a mouth-puckering sourness that is weirdly pleasant. The closet similarity in sourness and flavour to a tamarillo in terms of the Asian palate is tamarind paste, which is widely used in Asian cooking, particularly Thai cuisine. There are also some similarities in sourness/flavour with sun-dried tomatoes, concentrated tomato paste and canned tomatoes that are reduced in a slowly-simmered casserole, which is where we were heading with this dish. This ‘sweet and sour’ messenger RNA can confuse the Pleasure Centre of the brain however once the limbic system kicks in (that’s the bit that controls functions like emotion, behaviour, motivation, long-term memory and olfaction) one comes to appreciate that this is a wonderful balancing act and pivotal to the refreshingly tantalizing fruit ‘sweet and sourness’ of New Zealand Pinot Noir. Let’s face it; it was always going to be a lamb dish. And as symbolic roast lamb is to New Zealand, it is also a staple throughout much of Asia, however our dish needed a saturation of sauce and spicy sweet and sour richness and what was required here was a slow braise and subsequently an appropriate cut that becomes wonderfully tender and infused with the spices thus we opted for lamb shank. Chef Ahad’s inspiration for this dish comes from her fascination with Persian cuisine to which she has interpreted an ancient dish with a hedonistic melange of spices with an emphasis on cinnamon and turmeric, picking up on the macromolecules of New Zealand Pinot. There is also the tamarillo-effect with the recipe using canned tomatoes and tomato paste – but the secret ingredient here, or not so secret now – is dried Persian lime which is a brilliant souring agent that has an acidic lift similar to sherry vinegar but also a sensual exotic muskiness, the combination consummating this marriage of New Zealand Pinot Noir and Asia. Dried Persian limes (Limou Omani) can be found at Middle Eastern or Persian stores and most of the spices from your Asian food store or even supermarket these days. 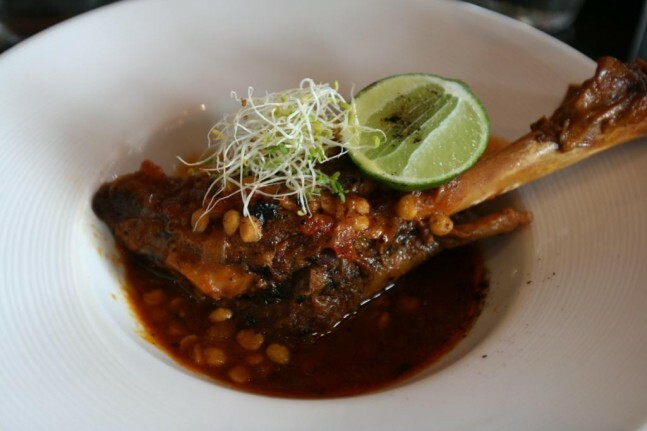 It is one pot dish that Chef Ahad says is embarrassingly simple to cook but like any simply dish there are no shortcuts and quality ingredients and technique are the key. You are welcome to share this recipe with everyone although please respect Chef Ahad and Coriander Leafs copyright and we hope it will inspire home-cooks, pinot noir enthusiasts and winemakers in New Zealand to get in the kitchen, but also wherever you are, to try this recipe and liberate a libational bottle of New Zealand Pinot Noir. 1. Sear the lamb shanks and set aside. 2. Over a medium to high fire, in a large saucepan, heat the oil – add onion and all the whole spices and sauté till golden. 3. Add the lamb shanks and the rest of the spices and seasonings and stir fry for 2 minutes. Then add the canned tomatoes and tomato paste and continue to fry till the oil separates. 4. 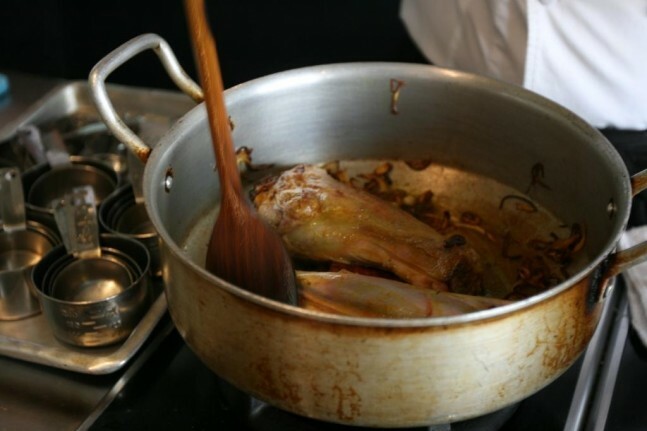 Add enough water to cover the lamb shanks, lower the heat, cover and simmer for 1 1/2 hours or till tender. 5. Add the split peas and the Persian limes and simmer for a further 30 minutes or till split peas are tender. 6. Sprinkle on cinnamon powder, if using, just prior to serving. Put some lime wedges on the side.